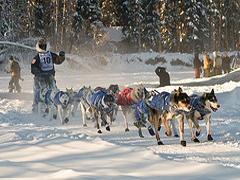 Yukon Quest Race History - The Yukon Quest International Sled Dog Race gets its name from the "highway of the north," the Yukon River, and historic winter land routes followed by prospectors, adventurers and later mail and supply carriers traveling between the gold fields of the Klondike and those within Alaska's interior. The Origins of the Yukon Quest - In 1983, four men, all mushers, sat at a table in the Bull's Eye Saloon, in Fairbanks, Alaska. The conversation turned to a discussion about a new sled dog race and "what-ifs." What if the race followed a historical trail? What if it were an international sled dog race? What if the race went a little longer? What if it even went up the Yukon River? As early as 1976, a Fairbanks to Whitehorse sled dog race had been talked of. But it wasn't until this conversation between Roger Williams, Leroy Shank, Ron Rosser and Willie Libb that the Yukon Quest became more than an idea. 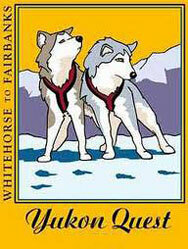 The mushers decided to name the race the "Yukon Quest" to commemorate the Yukon River, the old highway of the north. The trail would trace the routes that the prospectors followed to reach the Klondike during the 1898 Gold Rush and from there to the Alaskan interior for subsequent gold rushes in the early years of the 1900's. 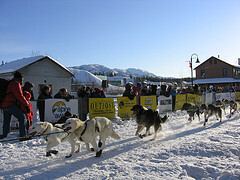 The first Yukon Quest International Sled Dog Race tested both race logistics and the talents of all involved. Twenty-six teams left Fairbanks that February day in 1984. Over the next 16 days, 20 teams made it to Whitehorse, with six teams forced to drop out along the way. 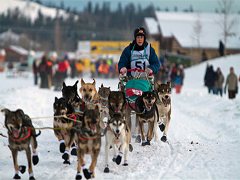 Sonny Lindner became the first Yukon Quest champion, completing the race in just over 12 days. Our adventure starts upon your arrival in Fairbanks, with most arriving in the late morning or early afternoon hours. Our evening's accommodations where we'll first rendezvous are at the Plane Country Bed & Breakfast located a short taxi ride from the airport. Situated on the banks of the Chena River, the Plane Country is named such, as just in front is a pond for float planes (ski planes in this season) and a gravel airstrip (and of course the proprietors are pilots). Before the afternoon is over, we'll head over to the University of Alaska to visit their excellent museum with hopeful views of the northern side of the Alaska Range, and then wander downtown to the headquarters and command center of the Yukon Quest. Here we'll get a glimpse of the tumult as the race is already underway, the headquarters staffed mostly by volunteers dedicated to the event and the sport in general. Dinner is on the town. B&B overnight. After breakfast transfer to the airport and to the "local" terminal for the air taxis that service all the outlying areas from Fairbanks. Our flight across the frozen mountains and tundra will take about an hour, ending in the tiny outpost of Eagle on the banks of the Yukon River, just four miles from the Canadian border. The only means of access to Eagle are by air or by surface via dog team or snowmachine over the river. Eagle has long served as the last supply post for the vast upper Yukon valley, providing the earliest miners and current wilderness dwellers with a link to the rest of the world. Its frontier nature hasn't changed and we'll bunk for the evening in historic cabins overlooking the Yukon. Listed in the Register of Historic Places, one of the cabins is where the famous Norwegian explorer Amundsen "wintered", after arriving in December 1905 from mushing by dog team from his ship locked in the ice 1000 miles to the north. After channeling the wild enthusiasm of the dogs into harness and sled, we'll drop over the bluff bank of the Yukon and head downstream past Eagle Bluff, long a landmark to river travelers of all seasons. As the dogs settle into the pace, we'll switch out and give each of us a turn on the runners. Heading around several of the sweeping bends of the Yukon, we'll steer toward Calico Bluff, a unique site of geologic study and plain beauty, with the swirling patterns of metamorphic rock. At the base on a bluff overlooking the river we'll find our toasty warm wall tent camp, with nary a neighbor for many miles. The remaining hours of daylight are open to snowshoeing, or mushing the dogs about the neighborhood, or x-country ski. We settle (dinner) into our wall tents for the evening. Step outside to experience the arctic night and the northern lights will surely see fit to give an appropriate display before drifting off to sleep. The morning will be determined by the Yukon Quest front runners, as we keep tabs on their progress by radio. Trying to time our return trip upriver to Eagle with their arrival will dictate whether our afternoon is as leisurely as the morning. Traveling the great Yukon we'll stop frequently to examine stories told by the animal tracks in the snow and some of the other seasonal phenomena that are hard to put into words when someone asks, incredulously, why one would enjoy winter. Depending on the weather and trail conditions, the mushers could be arriving in Eagle at any hour, with usually several of the front-runners traveling within a few minutes of each other. The official checkpoint is in the historic one room schoolhouse just up the road from our cabins and is a scene that has to be witnessed to be fully appreciated. With dog teams staked out in the schoolyard, the mushers soak in the easy warmth after miles of brutal trail, accepting many a helping from the ever full vat of chili and fixings prepared by the local townspeople. Today's activities depend on those of the top mushers, and when they decide to hit the trail. We'll continue to use Eagle as our base, and follow by dog team a few of those pushing on toward Fairbanks as the race tightens and those with a chance, executing their homestretch strategies. Following the location reports of the arriving mushers, we might head upstream toward Eagle Creek and the Canada border to greet and encourage those not yet to Eagle and their long anticipated rest. If the conditions and timing are just right, we might possibly head back down to our camp at Calico Bluff, as it is on the race route, though at this point the front-runners will be all business, rested and jockeying for position as the finish line in Fairbanks awaits. Our lodging for the night will depend on our choice for the day, either in the Calico Bluff camp or back in Eagle at the cabins. Either way, the northern lights will surely give us another display or make amends for the previous evenings' no show. Today's the day the "other" mushers arrive, those that know they have no chance of winning. Some are merely trying to survive and make it to the finish, having spent so much time, effort and money in training for the event they can't possibly go home to family and local sponsors without at least finishing. Others, mostly veteran mushers that maybe have done better in previous showings, view it all a bit more philosophically and at this point are out to enjoy. The atmosphere about the checkpoint is more relaxed, those there now with the leisure to chat at length and visit with local friends from previous Quests, or us as visitors curious about their lifestyle and motivations. Leisure time for us to visit historic old Fort Egbert, the army's northernmost presence until World War II, but closed not long after the gold rush of the early century. The atmosphere of the gold rush and Jack London permeate our whole time here in Eagle. Today we step from our time capsule and fly back to Fairbanks for another visit to the Yukon Quest command center and lunch downtown, before our return flights to our respective worlds. Back in the 20th century you'll probably want to keep up on the latest progress of each musher, and in doing so your mind might just wander to how that while in so many ways the world has changed, in some ways and places, it hasn't much at all.